NS-PRO is another quality product from NS Team. This box is the world's first complete solution for Samsung mobile phones. One of the best features of this device is lightning-fast update for new Samsung models that appear on the market. New enhance security protection is implemented to assure investment protection. NS PRO utilizes the latest smart-card security technology to ensure your secure long term investment. The box supports an majority of new Samsung cell phones. * Rim Blackberry unlocking is now available without any additional investments. Multiunlock Lite add-on comes free with Nspro and doesn't require additional activation. Nsmultiunlock is a paid additional module. Nsmultiunlock Lite comes free with Nspro. 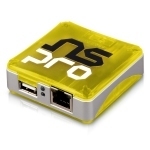 6 months warranty for NSpro box. Cables are not covered by warranty.